A new refrigerated van will allow Food Connects to expand delivery. BRATTLEBORO — Food Connects, a nonprofit organization that focuses on farm-to-school programming and wholesale local food distribution, added a new refrigerated van to its Food Hub fleet for deliveries. Food Connects was able to purchase the new refrigerated cargo van thanks to grant support from the State of Vermont Working Lands Enterprise Board and USDA Rural Development. The van allows Food Connects to have two drivers making deliveries simultaneously, increasing the amount of locally produced food delivered in southeast Vermont, southwest New Hampshire, and western Massachusetts. Deliveries are made to more than 100 hospitals, schools, independent grocers, co-ops, and other wholesale buyers in the region. Adding the van to the Food Hub fleet was necessary to keep pace with the rapidly growing demand for local food in the region. And the arrival of the van was well-timed, as sales dramatically increased this fall. Food Connects has had multiple and consecutive record-breaking sales weeks since the purchase of the van, and sales in September were higher than any single month in the organization's history. All of these dollars stay local and go back to more than 60 local producers in the community. The van presents even more opportunities for the future of Food Connects. It creates an opportunity to increase the variety of items sold, including the amount of frozen products it delivers to customers. Food Connects will be able to reach remote buyers more efficiently and more often, helping with their expansion of services to the Upper Valley region. It's also an investment in the effort to provide the best and most reliable customer service to all of the organization's customers, and it strengthens market development support for local agriculture and food businesses that is critical to the future of the rural economy. Food Connects is an entrepreneurial nonprofit that delivers locally produced food as well as educational and consulting services aimed at transforming local food systems. For one area nonprofit organization, a new refrigerated delivery van will make it easier to connect people with locally grown food and products. Food Connects is a Brattleboro-based nonprofit organization that delivers locally produced foods from more than 45 farms, vendors and producers to organizations throughout southeastern Vermont, southwestern New Hampshire and western Massachusetts. For food producers — such as Monadnock Region participants like Farmer John’s Plot in Dublin, Picadilly Farm in Winchester and Terra Nova Coffee in Keene — Food Connects helps streamline the wholesale distribution process, according to Laura Carbonneau, communications manager. “They don’t have to go and make all these individual deliveries; we aggregate it, and get as much back to the farmers as possible,” Carbonneau said. 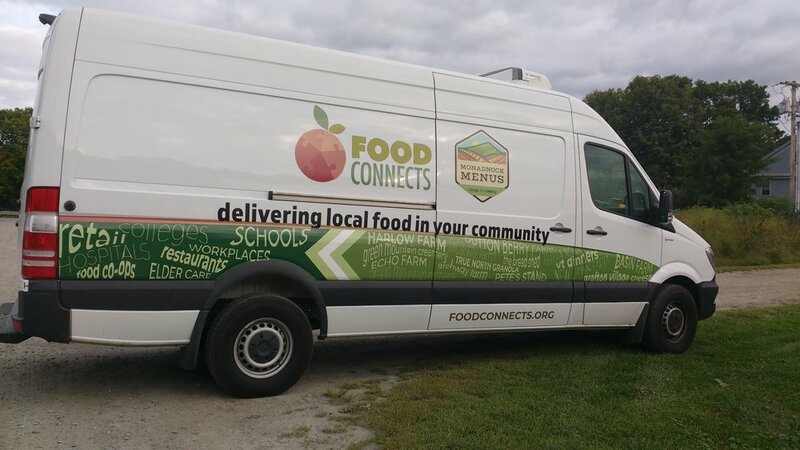 Food Connects was recently able to purchase a new refrigerated delivery van through grant funding from the state of Vermont Working Lands Enterprise Board and from U.S. Department of Agriculture Rural Development, which will allow for two delivery drivers to be on the road at one time. Until now, the organization hasn’t always been able to meet its demand with only one box truck available for shipments. But with the new refrigerated van, the organization will be able to increase the number of deliveries it’s able to make, Carbonneau said. Food Connects serves a wide range of organizations, from the Monadnock Food Co-Op to Cheshire Medical Center to the ConVal Regional School District. Beyond helping organizations purchase farm-fresh products, Food Connects also runs farm-to-school programming with networking and educational events in Vermont schools. For example, the organization helps facilitate taste tests for the Harvest of the Month campaign, which promotes seasonal eating. “Some of the support that we offer is helping food service directors figure out how to incorporate local food into their menus, because that’s not always the easiest thing to do,” Carbonneau said. In 2017, Food Connects also took over management of Monadnock Menus, a program the organization helped start through the Cheshire County Conservation District in 2013 to help area farmers and food producers market and distribute their products to different enterprises. Carbonneau noted that through operating that program, Food Connects has increased its focus on New Hampshire and the Monadnock Region. “Really we do focus a lot on New Hampshire and getting food into New Hampshire schools and stores, and we purchase from a lot of different New Hampshire vendors and farmers and producers. So it’s really not just a Vermont thing, and it’s becoming more of a tri-state thing with Massachusetts too,” Carbonneau said. Could 'medically tailored' rural food program work in southeastern Vermont? WINDHAM COUNTY — Two local men are dedicating efforts to see whether a successful urban program to bring "medically tailored meals" to housebound folks with illnesses could be mimicked in southeastern Vermont and rural communities. "It's just two of us pounding pavement," said Marty Cohn, a public relations professional who is working with Roger Allbee, former CEO of Grace Cottage Hospital, on the initiative. The idea is that illnesses with some of the highest health care costs — cancer, diabetes, heart disease and stroke — could all be connected to nutrition, Allbee said. He and Cohn visited Community Servings in Jamaica Plain of Boston in December to learn more about the "food is medicine" movement. The nonprofit started about 28 years ago with volunteers setting up meal deliveries for victims of the AIDS epidemic. Now, it has 60 employees and thousands of volunteers who "cook and deliver meals tailored to the dietary needs of clients managing various life-threatening conditions" in Massachusetts and Rhode Island, according to a New York Times article published in August. Community Servings worked with the Massachusetts Institute of Technology and the Center for Health Law and Policy Innovation of Harvard Law School on a pilot program to deliver meals to housebound people. The organizations developed 15 menus geared to those with illnesses. "They were able to make the matching," Cohn said. "So Roger and I are like, jaws are dropping, 'This is unbelievable. How come we don't know about this?'" A study was released in April 2018, and a report from Community Servings following the study stated $2.4 billion was spent in Massachusetts on medical costs attributable to food insecurity in 2016. "A growing body of research shows the promise of home-delivered meals to improve the health and well-being of homebound older adults," the report reads. "This research has laid the foundation for examining the potential of a more specialized intervention designed to meet the medical and nutritional needs of individuals coping with severe chronic illnesses, regardless of age, known as medically tailored meals." While the average monthly cost of "medically tailored meals" from Community Services is $350 compared to $146 for Meals on Wheels, average monthly medical costs were $843 for consumers of the former versus $1,413 for those of the latter, according to the report. Meal delivery services, food banks and senior meal events are all good resources, but are not tailored to fit individuals' health needs, Allbee and Cohn said. Allbee and Cohn began talking with Food Connects, a Brattleboro organization that delivers food from local farms to institutions such as Brattleboro Memorial Hospital and Grace Cottage. "They're very into health and providing healthy food," Cohn said. "We said we want to take it a step forward and provide medically tailored nutritional meals." He said Food Connects agreed to secure a $10,000 grant from the Vermont Community Foundation for a study on the feasibility of a southeastern Vermont program. Rep. Tristan Toleno, Windham-2-3, who runs a catering business and an intensive local cooking class for the Strolling of the Heifers, was tapped to see how a new meal delivery program might work in southeastern Vermont. "The other thing we wanted him to look at, and this is the thing that was the proverbially cherry on the sundae: Not only are these people at Community Servings providing these meals. They have developed a training program so that the people who are working at Community Servings preparing the meals and all that are being trained," Cohn said. "So it's an economic development tool, economic training." Cohn said a proposal he and Allbee put together was one of 21 selected out of 35 total submitted to the Dartmouth-Hitchcock Tuck School of Business. Students were assigned to analyze how a program could be set up successfully in rural areas. Cohn said both studies are expected to be completed by the end of the year. He is in talks with Community Servings about potential grant funding for implementation. Allbee said the meals would cut down on doctor and emergency room visits. He pointed out that the illnesses the meals are tailored to are prevalent in older people and Windham County is one of the most aging counties nationwide. "And the other thing that builds into this is, here's Vermont that decided it wanted to get all the Medicare money from the last administration to create an accountable care organization, OneCare [Vermont], to reduce hospital costs and the cost of health care," he said. "And this has been demonstrated to do it, but it's not being done in Vermont in this way." Allbee recalled conversations with teachers from medical schools who did not spend much time on nutrition in their classrooms. "I think that's changing," he said. "We never really looked at it as a way of reducing health care costs." The Center for Health Law and Policy Innovation of Harvard Law School advocates for policy reform. "The Food is Medicine Pilot would be a critical and innovative step toward improving the health of some of the most vulnerable members of our nation through facilitating access to healthy and medically-appropriate food," the center said in a report. "Inclusion of this innovative program in the Farm Bill is an opportunity to underscore the powerful role that food — and by extension, our food system — can play in addressing some of our nation's most complex and costly diseases." Allbee and Cohn said they have been in contact with the Vermont congressional delegation. "We're just kicking up some dust and I think it's all for the good," Cohn said.